The Masonic electronic forums have been lit up with brethren questioning whether there would be a masonic memorial service for our brother, President Gerald Ford. I have still not seen anything about such a possible service yet, in Washington or Michigan, but I did see a notice to the brethren in the Washington D.C. area. Masons will be gathering at Naval Lodge Hall (located at 330 S. Pennsylvania Avenue SE, Washington, DC), at 10:30 AM Sunday Morning, December 31st, and walk together to the Capitol Rotunda where the body is lying in state. Brethren are requested to please dress accordingly in mourning clothes, dark suits or formal attire. With the Grand Master's approval, officers should wear jewels and collars. Ah, the old fortune cookie was correct. After five years of shooting my mouth off about what should be done with the Indianapolis Masonic Temple, I was officially elected as a voting member of the Temple Board last night. 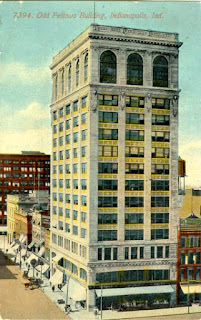 The 100th anniversary of the building is fast approaching, and much work needs to be done. With four lodge rooms, four social rooms, two ballroom/dining rooms, plus a floor for the Knights Templar Commandery, the Royal Arch Chapter and the Cryptic Council, one full kitchen, two other food preparation areas, and a 1000 seat auditorium, the building has incredible potential. 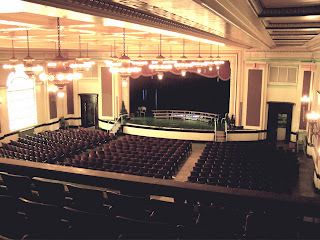 The auditorium itself has been opened to the public for music and dramatic programs in the last two years, but is in need of major work. With luck and a lot of work, maybe that will start to happen. The downtown Feast of St. John dinner was held last night,hosted by Wayne Guthrie Lodge. Close to 80 brethren were in attendance, and an outstanding time was had by all. All seen today in the opening paragraphs of stories about President Gerald R. Ford, the last president of the United States who was a Freemason. When I took my obligation as a Master Mason—incidentally, with my three younger brothers—I recalled the value my own father attached to that order. But I had no idea that I would ever be added to the company of the Father of our Country and twelve other members of the order who also served as Presidents of the United States. Masonic principles—internal, not external—and our order’s vision of duty to country and acceptance of God as a Supreme Being and guiding light have sustained me during my years of Government service. Today especially, the guidelines by which I strive to become an upright man in Masonry give me great personal strength. Masonic precepts can help America retain our inspiring aspirations while adapting to a new age. It is apparent to me that the Supreme Architect has set out the duties each of us has to perform, and I have trusted in His will with the knowledge that my trust is well-founded…. When you have a soft spot in your head for historic preservation, coupled with special interests in the structures of bygone glories like fraternal organizations and train stations - large spaces designed for hundreds of people that are now empty - you are apt to get your heart broken quite a lot. I had it happen Friday. Our lodge had just finished a funeral service for one of our members, and so I was already in a melancholy mood. I was driving through downtown Indianapolis, when I remembered one of those errands I had meant to accomplish for the last five or six years and never got around to it. I'm not a member of the Independent Order of Odd Fellows, but at one time in the U.S. the I.O.O.F. rivaled the Freemasons in membership. They are similar in their structure, their ceremonies and even their terminology. 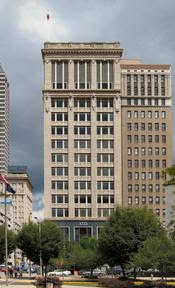 In 1908, they built an impressive 16-story building at the corner of Pennsylvania and Washington Streets. For a brief two years, it was the tallest building in the city. 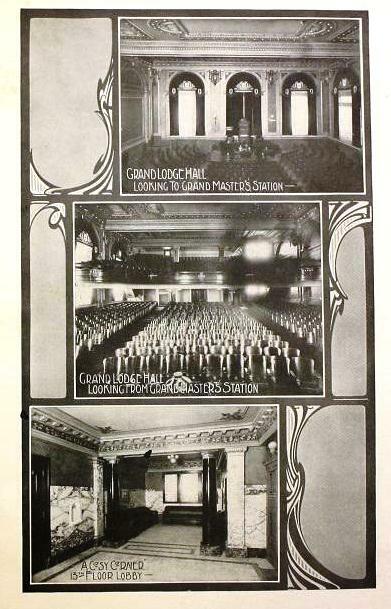 Apart from it being a lucrative corner for office space rental income, its principal feature was its large auditorium. But unlike most groups who built their auditoriums on the ground floor, the Indianapolis Odd Fellows turned their design upside down. Their large and ornate assembly hall was located on the appropriately numbered 13th floor, with three story-high windows that overlooked the city skyline. After the Depression, the Odd Fellows did not have the same kind of growth enjoyed by the Masons. They divested themselves of the building sometime in the 1960s or 70s, and among its tenants are the national offices of the Alpha Tau Omega fraternity. No outside evidence remains of the IOOF's former ownership, but I have long heard about that auditorium, tantalizingly up there on the 13th floor. So it was with a certain nervous eagerness I took the elevator up to the "Penthouse' floor of One North Pennsylvania on Friday, with the perhaps childish hope that remodelings and desecration by subsequent owners may have still preserved some of its former grandeur. Perhaps some developer with a little vision had saved the unique space. When the doors opened, it was clear that the floor had been remodeled recently, and that more was going on. One attorney's office was there, but the rest of the floor seemed deserted. At the end of the oddly zig-zagging hall was a door for a now-defunct restaurant called "Magic Moments." The location clearly was not magic for this business, as it was long gone from the premises. Tables and chairs were tossed everywhere, light fixtures dangled from broken acoustic tiles, and there was little that seemed magical about this place, much less impressive. Just another vacant piece of unrented office space in a bland building, with little to recommend it but an incredible view from its floor to ceiling windows. Then I looked up. Through the twisted rails of the unremarkable drop ceiling, my eyes followed the wires that they dangled from, up another twenty feet to an arching plaster ceiling. Magnificent scrollwork poked out between the ghastly tangle of flexible heating ducts, Romex and data cables. Scalloped molding in ochre, red and brown hues were hiding up there in the darkness, pockmarked by crumbling plaster and defaced by holes punched in it to make it easier for modern crews to hang their dull, lifeless, ordinary camouflage to cover it all up. Once I knew it was there, I explored a little more to see if any remnant could be found of a proscenium or other details. Every stairwell or empty office yielded nothing but disappointment. More than a few cinder block walls have been erected across the space as firewalls or supports for the new shortened ceiling. Yet I knew another two stories of the auditorium walls were back there somewhere. Finally, I discovered the stairway leading to the roof. At the 15th floor level, I discovered literally a hole in the wall, carved into an office for the defunct restaurant. Three sides were unpainted drywall, erected as false walls for a little privacy. But the fourth wall was the top cornice of an arch, with its massive piece of scrollwork dominating the tiny office space. One more flight up to the 16th floor revealed the attic space over the old auditorium. At last I got a sense of just how large an area the room had once occupied, stretching out under the rafters. But there was no beauty here, or forgotten magic. Only the crisscrossing supports that held the hidden plaster ceiling below, itself invisible to the unknowing, uncaring tenants below. The Indiana Odd Fellows have mostly been forgotten, certainly here in my hometown. They faded away, and are now reduced to an office out west past the Speedway, and a small rental space in an office park not far from my house. Their once thriving fraternity has all but vanished. And their crowning achievement in our downtown is but a forgotten footnote known only to students of the obscure. In that lies a cautionary tale for my own Masonic brethren who regard their own temples with contempt as "white elephants." They are only an eyesore if we let them become so. They are only fodder for the wrecking ball if we stop caring, stop maintaining them, stop planning for the future. The builders who came before us had vision and courage and optimism. They built these places for us, their descendants, and for future generations. They built them not just as crowning achievements, but as a plateau from which we were expected to take our fraternities to the next level. Can't we have enough vision and courage and optimism to at least save and maintain them? December is halfway over, and Hodapphaus is overwhelmed. Between some personal challenges, the wrapping up of Solomon's Builders, the first deadlines for a new book, several speeches around the midwest, along with the usual Masonic madness that comes in December, combined with the Christmas season, January can only be an improvement. My two years as Master of Lodge Vitruvian No. 767are coming to an end, and I am proud and honored to pass the gavel to Brother Phillip A. Garver. Phillip is an endlessly fascinating gentleman with an impressive and extensive background in religion, philosophy, history and initiatic societies, and we are all looking forward to the coming year working under his leadership. I would also like to publicly thank Wbro. Dale Adams, PM who is moving to the Senior Warden's position, and to Wbro. W. Keith Stiner, PM, our new Junior Warden. Wbro. Timothy R. Brinkmeyer, PM, will be our Chaplain. I will move to the Treasurer's chair, and Wbro. Nathan Brindle, PM, will remain in the Secretary's position. Nathan and I have been friends for nearly thirty years, and I am eternally grateful for the many unsung things he does behind the scenes at both Lodge Vitruvian and Broad Ripple Lodge No. 643. Serving as Vitruvian's Master for two years has been one of the most rewarding experiences of my life. It is interesting to note that had it not been for my association with this lodge, the events of the last four years of my life would have been very different, and undoubtedly I would not have had the opportunity to make the very unexpected career move as an author. I value the friendships I have made in all of my lodges, and I am proud to be associated with all of my brethren. But Vitruvian will always hold a special place in my heart. Back in 1996, Bishop Fabian W. Bruskewitz in Lincoln, Nebraska apparently excommunicated members of the Catholic reform group Call To Action. Call To Action understandably upsets the established hierarchy of the Church because it advocates female priests, an end to the celibacy requirements, democratic election of bishops, and a host of other reforms that are at odds with long-standing Church law. In his letter to the Vatican for a ruling on his judgement, apparently Bruskewitz lumped Call To Action members in with Planned Parenthood, Society of St. Pius X and its St. Michael the Archangel Chapel, Hemlock Society, Catholics for a Free Choice, along with the Freemasons, Job's Daughters, DeMolay, the Order of the Eastern Star, and Rainbow Girls. After ten years, Cardinal Giovanni Battista Re, prefect of the Vatican's Congregation for Bishops, got around to responding to Bishop Bruskewitz, upholding his order of excommunication within his diocese of Call To Action members. I say read these carefully for a reason. The Vatican ONLY upheld the excommunication of Call To Action members, and did not mention Freemasons and its appendant bodies in its response. It also seems to only uphold the excommunication within Bishop Bruskewitz's diocese. It should be of interest to Freemasons who are practicing Catholics. The new Pope takes a hard line on those who want to tinker with canon law or skirt church doctrine. In his own 1983 statement from the Office of the Sacred Congregation for the Doctrine of the Faith, then Cardinal Ratzinger made it clear that there has been no change in the interpretation of the historic encyclicals. The problem among U.S. Catholics for years has been the tendency to ignore church rules we didn't like - I count myself part of that group. The Church has a major problem with that. Catholics who don't follow the rules are trying to bend the Church into something it isn't. This Vatican isn't interested in liberalizing - and seems to feel that Catholics who want it to change can go elsewhere. And they have a side to their argument - the Church hasn't left its members, it is its members who are leaving the Church. It's a certain similarity to folks who dislike being told their activity is a sin. We want to keep doing it, we just don't want people to tell us it's a sin. If you read the articles, they also don't go for Catholics who support abortion. They aren't saying you can't be pro-abortion rights, they just say you can't be for them and be a practicing Catholic at the same time. They are mutually exclusive, and you are free to go find another church. These aren't the Middle Ages, and there are plenty of alternatives these days. I got a note yesterday from a former member of a Masonic Forum that I am an administrator for. He had been a Mason for 52 years, and was a Past Master four times. He is also a Catholic. Apparently, his parish priest saw his Masonic license plates in the parking lot and confronted him over it. The Brother was forced to choose between his faith and his lodge, and his faith won. It's not a contest. For him, his choice was a simple one. His Church said Masons would be excommunicated, so he resigned from the fraternity. As Freemasonry gains in public awareness, and potentially new growth, these conflicts will increase, and our Catholic brethren will be forced to decide. It's a shame, because Masons know that the root reasons for the Church's objections to Freemasonry are based on false premises and events from the past. And regular Freemasonry, especially in America, is also tarred by the activities of irregular Masons like the Grand Orient of France who really have - and continue to - fight against the Church and publicly support laws that restrict religious freedoms in other countries. US and UK Freemasonry does no such thing, but we suffer at the hands of others. I fear the result will be the loss of more brethren who will be forced to choose. I have spoken at length with a brother who is a member of the GL of Texas and was present at the GL session today. He tells me that the matter of recognition came up and the Chairman of the Fraternal Relations Committee spoke in detail length about the matter. The Chairman said that Texas had already given its opinion that the PH GL of Texas was regular several years ago. He stated the facts about the practice, nature and history of PH Masonry and recommended that recognition be given as requested by the MWPHGL of Texas. When the matter of visitation came up, the Chairman said that the GM of the PH GL of TX did not request or desire visitation. The vote was a simple majority and passed with about a 75% - 25%. I was told that if full recognition with visitation had been on the table, that would have also passed. It would seem that the reason for non-visitation is due to the lack of desire on the part of the PH GM. I would be interested in hearing from someone from the MWPHGL of TX. It appears that the next move is in the hands of the Most Worshipful Prince Hall Grand Lodge of Texas. We had a similar situation for a brief period in Indiana, several years after joint recognition was passed by both Grand Lodges. A new PH Grand Master arrived and canceled all visitation to PHA lodges from mainstream members unless he specifically reviewed and approved of such visits individually. It was a long two years. Fortunately, his successors have been far more open-minded. Let's hope our Texas PHA brethren drop those barriers soon. There's a hot rumor going around that the Grand Lodge of Texas has voted to recognize the Most Worshipful Prince Hall Grand Lodge of Texas. Preliminary reports say the vote was approximately 70% to 30% in favor. No visitation yet, but a crucial step has been taken. Hats off to my Texas brethren!